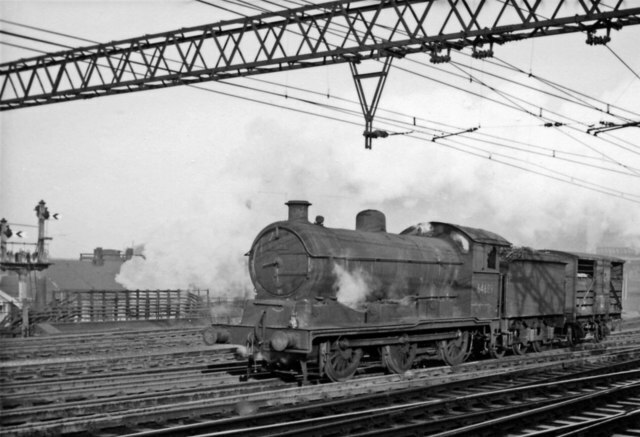 Seen from the extended Up platform, from which the traffic on the Low Level lines could be seen as well - see the signals at Fork Junction and the smoke of an engine working northward, ex-GE Hill D81 class (LNER J20) 0-6-0 No. 64689 seems to be making a rather superfluous trip from the Temple Mills direction. It was built as GE No. 1284 just before Grouping in 11/22, became LNER No. 8284 (No. 4689 in 1946) and lasted until 1/61. This page has been viewed about 297 times. This area has changed a lot in the 12 years since Ron Hann's views were taken. The Central line, DLR and Network Rail platforms are still there, but now with the dramatically impressive station building (1999 RIBA award winner) alongside to the south, giving access to Jubilee and North London trains and the new bus station. Meanwhile on the north side, the International station, serving the Channel Tunnel to St Pancras line is nearing completion. Further changes are due as the DLR takes over the section of North London line south of Stratford.